The TRUTH under FIRE: PRE-TRIB OR POST-TRIB RAPTURE? 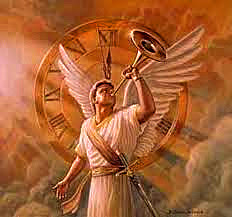 (4) The trumpet of God. (6) The caught up (rapture). (7) The meeting in the air. Right here you can add gasps, shortness of breath, and clutching your heart. Yes, it's true - seven (count them) stages. BTW, the following pretrib traffickers don't know yet about this new discovery: Crouch, Hagee, Hindson, Ice, Jeffrey, Jeremiah, LaHaye, Lindsey, Lutzer, Markell, Missler, Stanley, Strandberg, and Van Impe. If rapture discoveries are new to you, Google articles like "Deceiving and Being Deceived" by D.M., "X-Raying Margaret," "Edward Irving is Unnerving," "Walvoord Melts Ice," "Thomas Ice (Bloopers)," "Pretrib Rapture Dishonesty," "Pretrib Rapture Secrets," "Thieves' Marketing," "Appendix F: Thou Shalt Not Steal," "Pretrib Hypocrisy," "Pretrib Rapture Secrecy," and "Famous Rapture Watchers - Addendum." For more info on the exciting seven-stage rapture, Google Joe Ortiz's "End Times Passover" blog (Oct. 19, 2012) which can out-blog any blog that knows how to blog! 1) At no point does the Word EVER tell us that the Raptured are on there way to heaven. It does tell us that the raptured are forever more in the presents of the Lord. It does tell us that Jesus left the Earth to prepare a place for us, but it NEVER says that the raptured are now headed in the direction of Heaven. Jesus meet His own in the clouds/air/4 winds, and then continues to the Mount of Olives with all of His saints where He continues for 1000 years. 3)Here I noticed that you did not quote the whole verse, and the lied about it. The Scripture states that the DEAD are changed INCORRUPTIBLE, but the raptured are merely.. CHANGED. The dead receive the glorified heavenly bodies, the raptured are simply changed. Isaiah tells us the nature of this change in Is. 65... the youth that dies at 100 yrs of age will be considered a child... Wow that does require change. The raptured do not go to heaven, but are with Jesus on Earth for 1000 yrs. Only the dead prior to the rapture are in heaven experiencing the places that Jesus went to prepare for us. 2)You should read the chapter again...perhaps you will answer your own issue. You are confusing the end of the tribulation with the end of the millennium. 4) Apparently you aren't recognizing these verses as second coming in nature.. Luke 17. However you have backed yourself into a corner. Notice the parallel verse of your point... 1 Thess. 5:2, here again, no doubt, you are considering this verse as rapture related rather than second coming? If this be the case what do you do with the other two verses that state Jesus is coming, "like a thief..." Rev. 16:15, and 2 Peter 3:10. Those are clearly second coming in nature. You can't have it both ways. Jesus declares that He is returning for His second coming, "like a thief..." That simply cannot happen if a rapture took place 7 years prior. It would announce the second coming. Unfortunately the pretribbers are content to call Jesus a liar in the nature in which He personally declared how He would return for the second coming, "like a thief..."
5)Here again you use a second coming verse to describe the rapture. Matt. 24:36 starts out by saying, "of that day..." which day, the one just described in the previous verse... the second coming. 6)Read Rev. 16:15 I dare you! 8)Paul tells us that the rapture is not imminent... 2 Thess. 2;1-3 two things must happen first, one being the anti-christ being revealed... Don't know who he is because he hasn't been revealed yet. 9)really, I haven't seen the powerful effect you are speaking of, in fact it appears more that the age of grace is celebrated and the purification ignored. Especially being that tribulation and persecution are purifying factors. Paul gloried in his tribulations because it purified him... Rom 5:3. Jesus tells us that we are appointed to it... John 16:33, yet pretribbers run from it and only except it hypothetically. 11)The raptured are not dead... It is appointed for man once to die, after that the judgement... Heb. 9. This answers the first two verses. The next Rev. 19 the assumption that the (alive)bride is in heaven must first be addressed. The bride makes herself ready on Earth... 1 Thess. 3:11-13 for when Christ returns with His saints (bride who died and rose first) for her. To be absent from the body is to be present with the Lord. A good portion of the bride won't be raptured because they are already with the Lord. The bride cannot make herself ready in heaven... her readiness comes from the righteous acts of the saints. Paul makes it know that Jesus returns with His saints (dead) for His bride to rapture her. One question for you.. Why are you content to call Jesus a liar in the nature in which He declared He would return for His second coming, "Like a thief..." Rev. 16:15, 2 Peter 3:10, Matt. 24:42,43?